Look at all the Blogger RAK's I received in the mail today! I couldn't believe I got THREE in one day! woohoo! 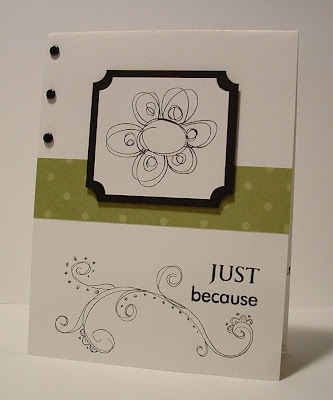 This beautiful Blogger RAK came from Marie McClellan. 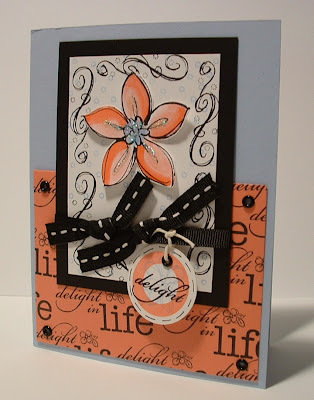 I just love this card Marie - it is so cute and I saw it on your blog when you posted it! I love how simple and elegant that it is. Thanks so much for making me the lucky recipient! Oh boy a cuttlebug Blogger RAK! 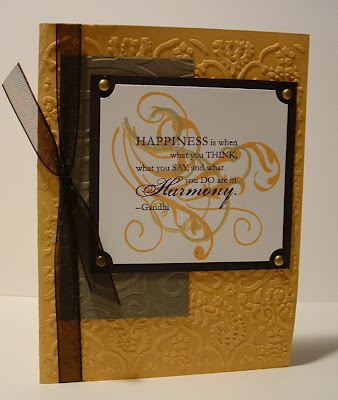 This card is from Charmaine - I just absolutely love that background and have been trying to get a hold of one of these for my cuttlebug - gotta have it! Charmaine thanks so much for this great card, I love it! Beautiful cards! I love your blog, and I checked out the blogs of Julie and Marie too. . .great stuff! You are very welcome for your RAK! Have a great day! I love all of those but especially the Just Because one. I LOVE that. Hey Girlfriend! How the heck are ya? I hope you are enjoying your vacation. How cool to received 3 RAK's in one day; lucky you. All of these cards are beautiful. Hope to talk to you soon. Those are gorgeous cards! One more beautiful then the other!!! You deserve them. You are such a wonderful and kind blogging friend to so many of us. So still no Beate mail? Dagnabit...where is that card! LOL I did send one a while ago. I might have to make another to chase the last one. Don't you just love happy mail, especially when it is this pretty!? Hey - great colour combo would never have thought of these colours together.....great!!!! !